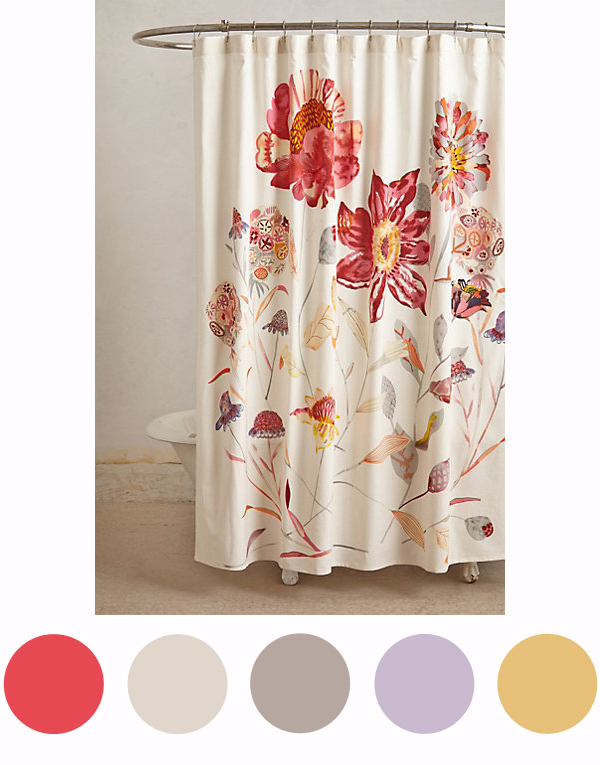 The next step in my guest bathroom’s mini-makeover is selecting a shower curtain to start as the jumping off point for the overall color scheme and concept. You can see in the before photos that the shower curtain takes up most of one wall. 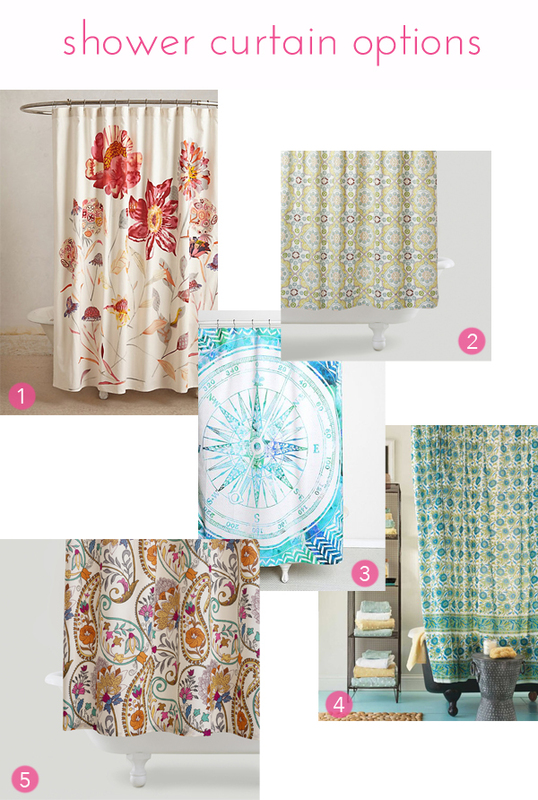 By choosing a colorful curtain with an interesting scheme, I’m incorporating what is basically a large piece of art…something to think about if you’re making over any small bathroom with an open tub. An all white curtain would seem like a missed opportunity, but I also don’t want it to be too loud and overbearing either. After all, it’s a small space with no natural light. 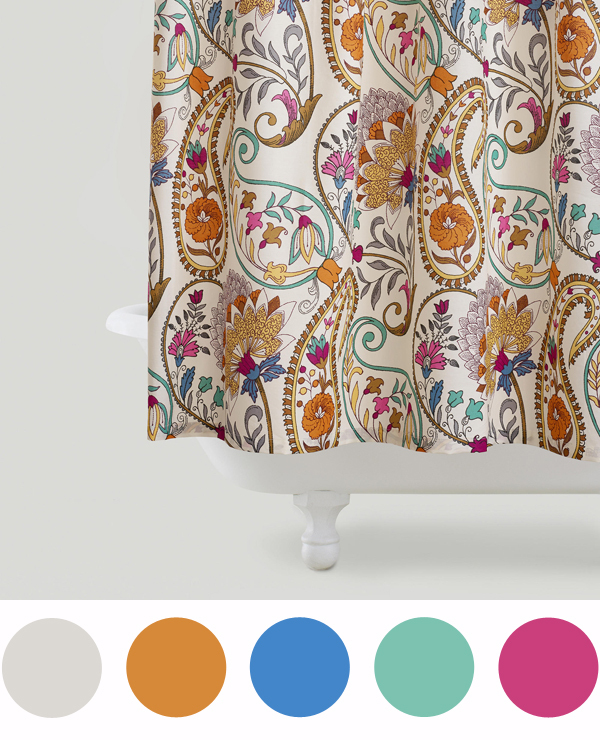 Here are five shower curtains that I thought had some potential. I was leaning towards the World Market Paisley Floral, and it might still be my top choice. I’m not a huge fan of paisley, but I really love the colors, particularly the teal, orange and pink. My second favorite is the floral from Anthropologie, even though the color scheme isn’t what I had originally envisioned. I love how it looks like a huge watercolor painting, and I’m really drawn to the combination of reds, purples and yellows. This is the color concept I pulled from the World Market curtain….looks pretty similar to my website, just a little toned down plus the blue. I would use the light, canvas colored neutral of the print’s background for the wall color above the tile. The brighter hues would be brought in as accents, and I’m definitely considering painting the vanity a fun color like the blue or jade. If I use the Anthropologie curtain, I would paint the vanity cabinet the deeper gray color and the walls the lightest color in the curtain. Then I would bring in the other colors through the accessories. I’m really drawn to this scheme because it’s so soft and peaceful. I don’t think that I would get tired of it very quickly. The pinky reds also connect back nicely to the vintage kilim rug in our dining room which is the closest room. And, in case you were wondering, I am not considering the beige tub at all in my scheme, since it will be hidden 99% of the time. So, what do you think? Which option should I choose?